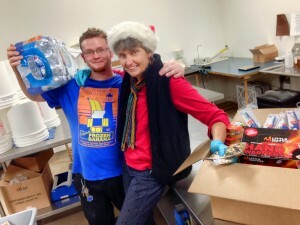 A new year… taking time to give back. 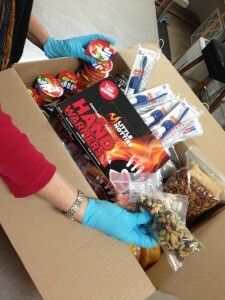 Sue and Denny, part of the rokz team – packing up some much-needed supplies for Occupy Medical and the people they serve. We spent some time this week packing up supplies for an organization that does some amazing work in our area, Eugene, Oregon. Occupy Medical is a group of healthcare professionals and support personnel who believe healthcare is a basic human right that must be made accessible to everyone, regardless of ability to pay. Every Sunday this team of all volunteers sets up a mobile medical clinic downtown Eugene to provide everything from prescriptions to herbal remedies to wound care. Beyond the medical offerings, there is food, hygiene supplies, counseling, and even haircuts. It is a place full of caring, positive support and an open door to services that for many are out of reach. Take a minute to see what the fantastic team at OM is doing and the ways that you can help expand the work they have begun. Here is the list of things that we included in our delivery this time. Find out more about what you can do to help Occupy Medical with donations of supplies, money or your time. 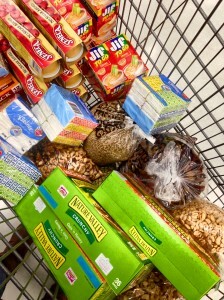 filling nourishment, and much needed protein and vitamin sources. 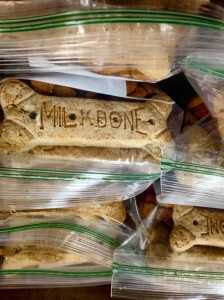 And of course, dog food and dog bones, for the four-legged friends that serve as protectors and companions on the streets that can be lonely and unfriendly. We look forward to working with OM into the new year — you all have inspired us. Bags with both food and a couple of treats make a nice pack to pass along. Buy single-serving supplies or bulk ingredients and repackage into small ziplocks.